With its silence, the Arab League is opening the door to Syria’s western enemies which have their own Middle East agendas. Another Friday, another 47 Syrian protesters have been consigned to coffins. The number of unarmed Syrians killed by state security forces since the start of the uprising is estimated to exceed 1,600, while those who are asking for President Bashar Al Assad to step down are growing. Particularly bad news for the former ophthalmologist turned Syrian leader, who came to office pledging liberal reform, is the fact that dissent is fomenting on the streets of the hitherto peaceful capital Damascus. 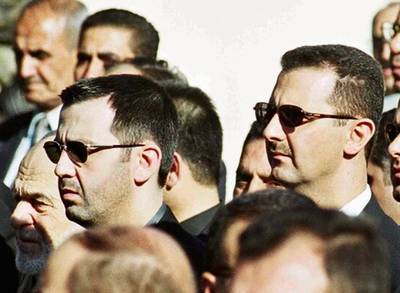 Al Assad’s repeated claims that demonstrations are being fuelled by thugs and foreign conspirators are sounding hollow. The Syrian people want the same things that brought Tunisians and Egyptians into the squares: an end to corruption, improved job opportunities, increased civil liberties and a democratic system of governance. Sadly, their just demands have been met with snipers’ bullets, mass arrests, torture and executions. It appears that the government has learned nothing from the Tunisian and Egyptian revolutions, which have resulted in the arrest and trials of former leadership members. Or from the conflict in Libya, triggered by a stubborn dictator who has drawn up a suicide plan for Tripoli in the event his troops are overwhelmed — and is now wanted by the International Criminal Court. Al Assad should have sniffed the air of change throughout the region and listened to his people’s appeals from day one, which would have prevented bloodshed and may have kept his regime in place. Now that Pandora’s Box has been opened, there is no going back. The president should lance the boil by calling for free, fair, multi-party elections even if this will result in the end of the minority Alawite rule. As long as he hangs on by his fingernails, not only will Syria be unstable, so will Lebanon, leaving both neighbouring countries vulnerable to Israeli aggression. “If you say God, Syria and Bashar, I say God, Syria and my people. I Bashar Al Assad will remain dutiful and faithful to my people …” the president is quoted as saying on his website. His brutal crackdown forcing over 6,000 refugees to surge into Turkey, where they are being welcomed in tented camps, belies those fine sentiments. The Turkish Prime Minister Recep Tayyip Erdogan has stood up to be counted. Besides making provision for Syrian refugees he has been outspoken in his condemnation of the Syrian government, characterising the crackdown as “inhumane” while his foreign minister is at great pains to point out that “if there is a problem, it must be resolved in the family”. Unfortunately, Syria’s ‘family’ is behaving like the ‘see no evil’, ‘speak no evil’, ‘hear no evil’ three wise monkeys. Arab leaders are either in denial fearing yet another Arab leader will bite the dust or preferring to stay tightlipped until the final outcome. On Wednesday, Arab League chief Nabeel Al Arabi met with Al Assad in Damascus and emerged from the meeting slamming foreign interference “in the internal affairs of Arab countries” which translated means western interference as it follows a visit by US and French ambassadors to the tinderbox-like city of Hama — site of a Syrian Army massacre in 1982 — and an assertion by US President Barack Obama that the Syrian leader was losing legitimacy in the eyes of his own people. Indeed, the usual suspects among the five permanent members of the UN Security Council (UNSC) are itching to punish Damascus under the pretext that it stonewalled an investigation by the international nuclear watchdog the IAEA into a Syrian military complex that Israel destroyed in 2007. But, until now, their attempts have been thwarted by Russia and China. Amnesty International has called upon the UNSC to refer Al Assad and some of his ministers to the ICC for crimes against humanity and, at the same time, Washington is exploring imposing further US sanctions on the Syrian leadership. Should Russia and China become embarrassed enough by the Syrian regime’s brutality that impacts women and children, it’s conceivable that Syria could share the fate of Iraq or Libya. With its silence, the Arab League is opening the door to Syria’s western enemies which have their own agendas in the Middle East. What’s happening in Syria affects all 22 League members because as each day passes a new regional power paradigm is being created. If Arab states insist on fence-sitting, they are abdicating their duty to stand on the side of right. How can they remain neutral when the rest of the world isn’t? It’s time they decided which side they’re on. Are they with Al Assad or with the Syrian people who haven’t tasted freedom since emergency law was imposed in 1962? The Arab League should be as proactive over Syria as it was with Libya and is now with its blessing of the Palestinian National Authority’s attempt to get UN recognition of a unilaterally-declared Palestinian state. The Arab League and the GCC should loudly condemn the killings in Syria, do their utmost to mediate a resolution and dig deep into their coffers to assist Syrian refugees in Turkey and Lebanon. As long as Arab leaders remain in a condition of paralysis, afraid to exert influence in their own region, Arab states will be like straws blown about by a breeze from western climes.